I have just made a mark in the history of Dazed by Life ! for the month of November 2012. It's an extraordinary feat indeed ! Guess you can see clearly now....having a lot of fun, aren't they ?! I bet you've seen the girl in the middle ! Hey !.... wheredoyathinkyourgoin ? ?, I ain't done yet !! 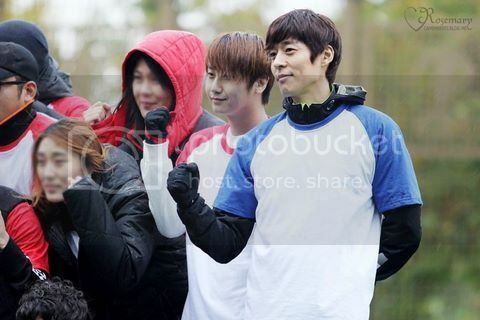 I noe I noe...it's leader ! But we've got to come down a bit....try to look past Hyun Joong, to the back, you'll see a tall guy in blue...now, THAT's Ji Suk. 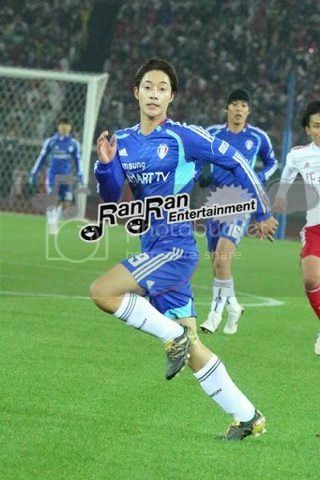 Ji Suk's been a member of FC MEN soccer team for some time now...I've seen him playing with Hyun Joong two or three times. 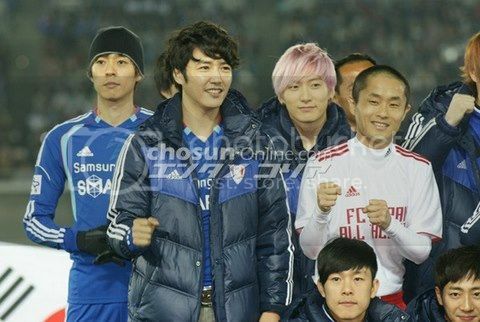 [ Suddenly I imagine if all 5 members of SS501 were in this team....oh...mission impossible. Btw...this is off topic, but have you seen how much more gorgeous Kyu Jong is now ??? !! the army really agrees with him :)] . 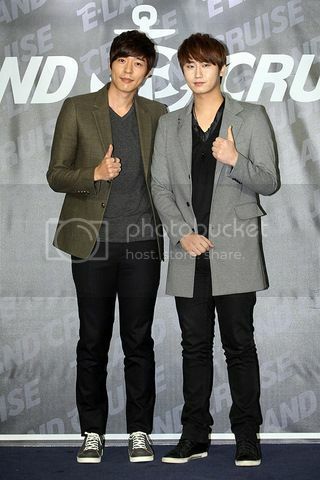 Where was I....gee got side-tracked by wuri sweet SS501 center :)....oh yes, Ji Suk and Hyun Joong ! 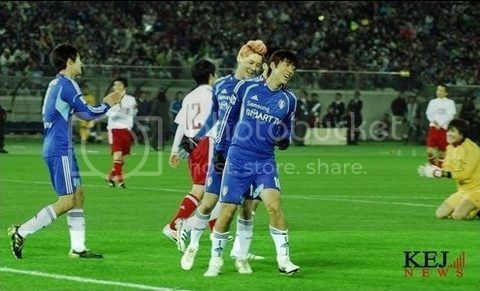 !.....got a few pics of them in the soccer match in Japan, plus added bonus....Junsu ...hehe...captain Xiah. His hair looks like dessert to me. 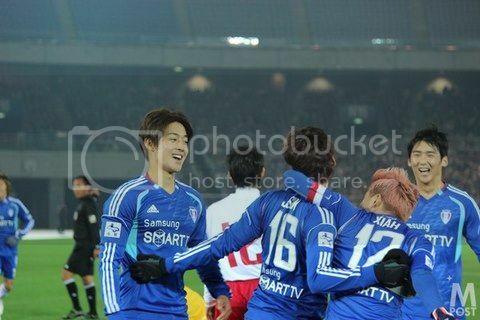 Btw, you know Leader's number is 9, right ? 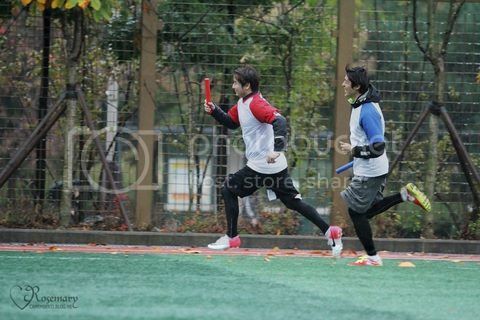 Xiah is 12 and Ji Suk is 16. OH ! 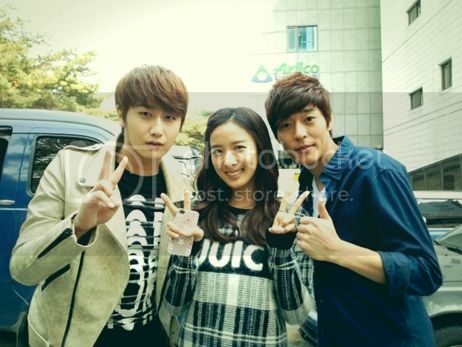 It's OSKA....from "Secret Garden" ! This is the first time I've seen him in FC MEN. 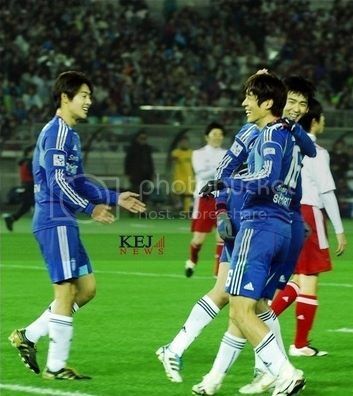 Well, it's been fun seeing Ji Suk becoming friends with two members of SS501... I'll end this post here with the hope that I'll have the time, energy and mood to post more things in this blog o' mine.... TTFN !